For high quality and low maintenance, try this time saving lawn today! While maintaining a rich green color, TurtleTurf promises to drastically reduce your cutting frequency. Less grass cut translates to less grass clippings to be removed. With today’s rising cost of lawn maintenance and increase in environmental restrictions, TurtleTurf is the perfect solution. 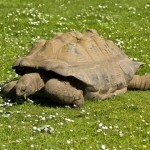 Unlike most varieties of grass, TurtleTurf actually performs better without the aid of fertilizers. TurtleTurf has undergone extensive testing in various climates. It is proven to be suited for a variety of applications. Wherever grass maintenance is a concern, this dense, slow-growing turf will flourish. Sites already benefiting from TurtleTurf’s features include: Golf course fairways, office parks, airports, and private lawns. TurtleTurf also performs well for erosion control along roadsides, in roof gardens, and for general revegetation. TurtleTurf’s dramatic cost savings becomes more apparent if you consider an application such as an 18-hole golf course. A typical growing season results in 450 hours of mowing time. With a 40% reduction in mowing, translating to 10 hours per fairway per year, the total savings in mowing hours would be around 180. A substantial reduction in mowing hours results in a substantial reduction in labor costs, machinery and fuel. With its outstanding drought tolerance and disease resistance, a golf course utilizing TurtleTurf also realizes direct savings in fertilizer and irrigation costs. Beautiful lawns and parkways are an integral component of the American landscape. However, a beautiful lawn comes at a high, often hidden price. Water availability, cost, use, and the impact of yard maintenance on other natural resources (e.g., landfill space and fossil fuel depletion as well as chemical pollution of ground water from fertilization) are important political topics in many communities around the country. For many years there have been few choices for people who want both the look and feel of a beautiful lawn and to be environmentally responsible. 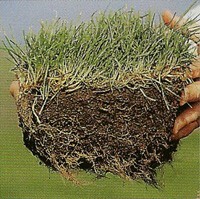 Turtle Turf low maintenance grass seed has undergone extensive testing in various climates. It is proven to be suited for a variety of appliations. Wherever grass maintenance is a concern this dense, slow growing turf will flourish. Dramatic cost savings is apparent when you consider less hours spent mowing and less water due to its great drought tolerance.